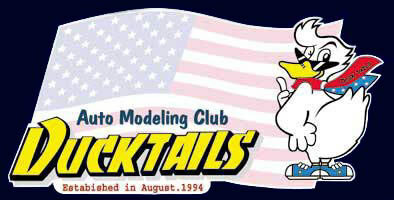 Ducktails Auto Modeling Club (shortend to "Ducktails") is a scaled car modeling club ,which was established, August 1994 in Kanagawa, Japan,originally as Navigate Models Club. Today we are active across the countrymaking use of the internet. Our commmon preferences is American cars in'50's to "70's, as well as clasic cars, racing machines ,as our interest. "Ducktail" indicates a certain rear end style of the sport car as well asthe rear style of the regent hair which used to be the most popular hairstyle of the youth in '50's and '60's. Ducktails Auto Modeling Club gathers those who share the same wishes to love car modeling, to better enjoy modeling by respecting and helping each other,and even to spread out the circle of modeling. We oppose to criticizing others models, or restricting the item or how to build it, only to make it unenjoyable to build models. We always try to be thoughtful to each other,to accept the differences in taste and ways to do, and to support each other to better enjoy modeling. In the western world it is considered a proper hobby regardless of gender or age. You will see at their flee markets many women browsing around the kits and elderly persons walking around to look for old kits for nostalgia. Their model car industry seems to have a variety of venders and number of new products being briskly developed. We hope to pay every effort to make the modeling circumstances of Japan closer to that.